Coach Rob and I have been talking about gearing lately, in particular what would be the best for Haute Route. My initial thought was that I had no initial thoughts, just assuming that my Compact set-up (50/34 – 12/27) would be just right. However, there could possibly be an advantage to getting more top-end speed on the descents (I max out at around 55 kph while pedaling right now). To be honest, I don’t think this is going to be a real issue for me because I’ll probably be happy to rest the legs on most descents and not worry about pedaling if I’m traveling faster than that. I’ve never been in a group on the flat that has rolled at 55 kph for any length of time either, so I still think the compact is the way to go for me. But all this got me wondering what others might be considering. I already know that one of my teammates on Team Vicious Cycle was looking for a chainring in between Standard and Compact, so I’m sure he’s not the only one. Will the best (Rich, maybe you could enlighten us on this?) be riding standard gearing? I shudder to think about how strong you’d need to be to accomplish this. Here’s a poll, but you are free to leave a longer answer in the Comments section. This entry was posted in Cycling and tagged haute route alps 2013, haute route gearing. Bookmark the permalink. I rode with an SRAM 52/36 both years. and 11-25 in the back, so 36-25 was my lowest gear. I think 50-12 for the biggest gear is a tad small (I had 52-11). Why not keep the same cranks and switch from an 12-27 to an 11-25. I think a 34-25 should be small enough for most of the Haute Route climbs. These are the Alps we’re talking about, so most of the climbs average 6-8%, and you are rarely if ever above 10%. That’s great advice and a tentative conclusion that Rob at least came to (although maybe different numbers). I suppose my fear would be running out of gears, but then again, I don’t think I even needed the 27 (I might be optimistically wrong on this one, though) on Ventoux and the Etapes last year, so I’m sure you have something there. I just check the Campagnolo site and I would even be able to lose 30 grams by switching to an 11-25. Sold. I remember in the late 80s I first rode the Alps. There was no internet, few books and almost no knowledge at the local cycling club. So I turned up at l’Alpe d’Huez with the low gear that my local bike shop recommended – 52/42 with 12-26. I think it may have been a seven speed too but could have been an 8 speed. How I enjoyed that ascent! 😉 I was barely able to turn the cranks and was tacking up the road to try and make the gradient easier. I’m surprised more people don’t go for Rohloff (okay besides the price) to avoid huge gaps in gearing. Sheldon Brown, rest his soul, is always useful with his gear calculator http://sheldonbrown.com/gears/ which allows standard blocks to be inserted quite easily. Sheldon Brown was the first place I ever encountered the confusing world of gear calculations. 5 years later I’m slowly getting my head around them. So you’ll be riding with a Rohloff then, Jules? Excuse my ignorance, but what kind of range can you get out those things? I like my derailleurs and can’t afford to spend £800+ on a hub and then have a wheel made around it. But many people who ride long distance touring do it because it is less vulnerable to damage if the bike falls and is well engineered and fairly low transmission losses as the chainline is straight. Because it requires no offset then it is equally strong on both sides of the hub as there isn’t the extreme dishing on RHS of wheel that a large 10 speed cluster requires. It has a gear range of 526% i.e. 5.26 times the ratio of chainring to sprocket. Unlike a derailleur when some are avoided because of mechanical sympathy of avoiding too much chain bending from smallest sprocket to largest chainring. It is 14 gears and the steps are all equal between them. The total weight (about 1/2 lb extra compared with Tiagra setup) is very similar since ordinary brake levers can be used, no front shifter, only one chainring, simpler brake levers. Chains should also last longer and don’t have to be the super thin and flexible (and hence costlier). Use the Sheldon Brown gear calculator and select Rohloff in the Internal Hub Gear drop down. With 52 front and 13 sprocket you get a range from 29 to 154″ I think the standard is rear is 16 which gives stair climbing ability. But they visually jar because it looks like your glamorous racing bike is set up with a Sturmey Archer hub or dynamo hub. If they do go wrong then it can be very expensive and whilst thye use fine Swiss engineering they are not totally fault free. Intriguing stuff, Jules. I wonder why these things have never been used in racing. Is it a weight issue, or lack of fine-tuning (I’m assuming, if you only have 14 gears) ability, or just because nobody has bothered to try it yet? I know I won’t be breaking the mold because my budget is already shot for Haute Route. I have a world-cycling friend who used Rohloff and it seems to be the thing to do for world travellers who can afford them. Someday, when I make my perfect tourer I’ll give it a shot. I briefly considered the 29 when I upgraded to my Chorus 11 speed, but I think I’m glad I didn’t now. I have never felt the need for that extra gear…yet. The Haute Route will be the place, if it is going to happen! Yeah, I think it’s either two clusters or two cranksets. I can’t remember which one was easier to change out, but I have a feeling it was the cranks. And I am sure you’re right about me looking for the easier gears, rather than the other end of the spectrum. I’m going to test out Ventoux in the 25 next time I go up and see if I think I could handle it over a lot of mountains. 34/25 works out to be the same as 36/27. For simplicity’s sake I might just try and choose one set-up and live with it, for better or worse. hey Gerry..I rode last year with a 52/36 and a 12-28….always good to have a bailout gear, especially when you tackle those climbs day after day..
52/36 sounds interesting, but I think I might be leaning towards a cassette change now. I just remembered how much my crankset cost! To continue, I tend to spin a lot but I find that gearing more than adequate on the flat when riding with the club. My cadence on the flat with the club is well over 100rpm so I think it depends what kind of a cyclist you are. Higher than mine, for sure. I like to roll at around 85 or 90 on the flats. That’s a very good point to remember, too. I’ve tried high cadence, but my ‘sweet spot’ is just lower, I think. You need lots of brakes for Ventoux, that ain’t no lie! I really can’t remember how much I used my 27 on Ventoux throughout last season. I am sure I got in there on the steep bit through the forest, but not sure how much. I’m hoping I’ll be stronger and lighter this season, so maybe…maybe I will be able to get a little more aggressive with gearing. The Rohloff pays for itself in the long run. No need to be endlessly replacing cassettes and chains. I found the evenly spaced gears great and because you can change them at 1mph if necessary, you need never be in the wrong gear having mistakenly thought that you were harder than you actually were. Of course my usual speed is 15 mph so my thoughts may not qualify as helpful. I guess this begs the question then, why is Rohloff stylish..? Just needs the right marketing, I’m sure! I’d love to try it out sometime. I ride a 50/34 with 11-28, which is necessary for some of the steep hills around here, maybe overkill for the Alps. That was still what I was planning to ride with at HR (and will in 2014). Like Rich said, the Alps are not going to require that much gearing, but you might appreciate a little break after so many days and so many climbs. I think I’m settling in on the ‘2 cassette’ idea that Rob originally brought up (as well as others here). I’ll test the 25 on Ventoux next time I climb it and see if I have the confidence to leave my 27 in the hotel room. 50/34 x 11-26. Works great in Front Range of Colorado, I am assuming should be OK for Alps? Decent low-end and a smidge more high-end speed. Doug, really depends on who is riding that 11-26! But yeah, from my experience in the Alps, I’m sure the 26 would be fine. Unfortunately Campy doesn’t make an 11-26, so I think I’ll be going for 11-25. There’s a good article/review about the Rohloff system in the French magazine CycloCoach (mars/avril) entitled ‘Have we uncovered the velo of the future’. 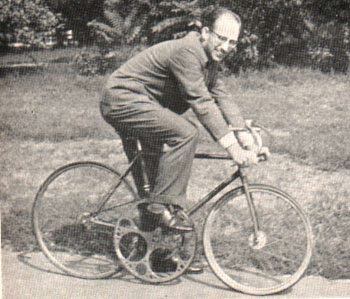 The Rohloff system he was using didn’t have a chain but instead it had a carbon belt (like a fan belt on a car) with 113 teeth, 55 tooth eccentric ‘chain’ ring in the front and a 19 tooth cassette at the rear. He was impressed by it’s quietness and its lack of grease/oil. No derailleurs to accidentally damage and 100,000 km guarantee on the system. I wouldn’t mind trying one at some point. It’s good to read some feedback from previous HR riders. I’ve been thinking of changing my rear cassette as I’ve found myself digging deep on the last cassette on some of the hills around here (12-20%) but now that I know that the HR seldom gets above 10% I may be able to get away with what I have. But an extra gear would be nice. I agree, Luc. This kind of info is invaluable. Very interesting info on the Rohloff. I think maybe I just saw a ‘chain’ like that on a fixie the other day. It just looked like a rubber fan belt to me. Really interesting what can make a bike go! I’ll definitely look into Rohloff when I make my touring dream machine in a few years time. Having ridden a little in Switzerland, I can confidently say that the roads we’ll be plowing over in the Alps will seem flat for you. I distinctly remember more than one 20% hill I had to haul my bike (with ‘cross gearing), me, and a fully loaded BOB trailer over to get to where I needed to get to. Killer stuff. Whatever you have – around day 5 you’ll wish you had a bigger gear. I had a Campag 50/34 and 12/29 and was happy. Lots of people had the mountain bike gearing with 32 on the back and I’d have preferred that. Frankly very few people are pedaling on the descents and, on the rare, flat bits 20 to 25 mph is comfortable with that gearing. Gear for the climbs. It’s good to be able to switch styles – from grinding to spinning. Almost as good as a rest. Excellent advice! My thinking is the same as your re the descents, i.e. I won’t be too concerned with pedaling on them, other than getting out of hairpins, I suppose. The range of what people had is huge, but that’s not surprising given the range in strengths and abilities in an event like this. I think the ‘right’ answer is to know yourself and choose what you know you can push. Then again, your comment about ‘day 5’ is golden. Thanks. Just one further thought. A one-day etape or sportive is different. You can give it your all. Just because you get up Ventoux or wherever on a standard with an 11/23 doesn’t mean you’re going to do the same after 5 days in the saddle. I’m sure you’re right. I’ve got a Ventoux training camp of sorts planned for July, so the gearing issue will become clearer then, I hope. I have never done multiple days of Etape-length events, so it’s all uncharted territory. Are you doing HR again this year, by the way? This is pretty much my thinking. I’ve done a few multi-day climbing events, and it’s always best to prepare for how you’ll feel on last day as it is for the first. Bringing two cassettes might be ideal, although from what I understand of HR, it is difficult to transport equipment from stage to stage (could be wrong about that). I’m not sure I would go as far as mountain bike gearing since you’re going to have the fitness, but I would make sure one your cassettes is for an easy day. You may end up using that for the last few days, and you’ll certainly appreciate the granny gear. Not doing it this year Gerry. Can’t spare the time for the training. Will head to the mountains sometime in the summer but there will be a lot more cafe stops this time! Just bear in mind that the climbs may only be 40% of the stage but you’ll spend 80% of your time on them. So gear for climbing and forget the rest.